This is an elegant love knot design comfort fit wedding band that is 8.5mm wide. 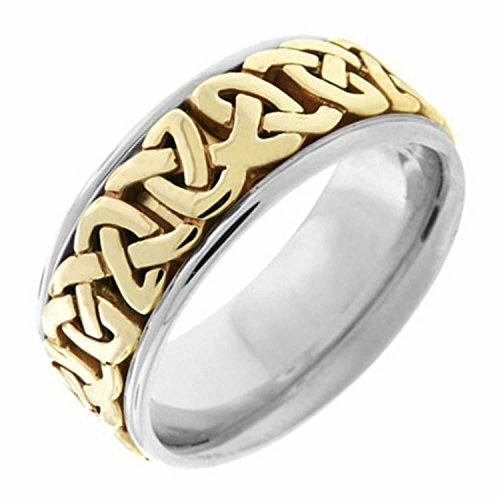 A celtic style of solid white and yellow two tone platinum and 18k yellow gold metal, the white metal of the ring is made of 95 percent pure platinum and the other colored metal is 75 percent pure gold. This has two stamps in the inside of the ring; PLT950 and 18K. Manufactured in the U.S.A. Manufactured using the die struck process for better durability and minimal porosity. This ring can be resized from size 13.75 to a size 14.75 by a professional jeweler, but fees may apply. Be aware that any third party modification will void its warranty. The actual color of the product may vary from what is shown on your phone, tablet or computer. The weight of the ring varies depending on the size, let us know the size and we will tell you the weight. If you are not sure of your size? Request a free ring size gauge first before you order, just email us your shipping address. Receive FREE ENGRAVING, a $35.00 value, after placing the order, please email using the ASK A PRODUCT QUESTION button on the orders page, the message and the engraving font (Arial or Script). For Amazon mobile app this button is not available just call 877.746.4007 for assistance. Opting for engraving will not cause a delay on shipping your order. All shipment of orders are fully insured and requires a signature on delivery, make sure someone's there to accept the package. Email us for any question or concerns.